Retail runs in a very predictable cycle of sales and clearance. If you keep track of it, you can save money. If you don’t want to keep track, just keep reading our blog, we will do it for you. 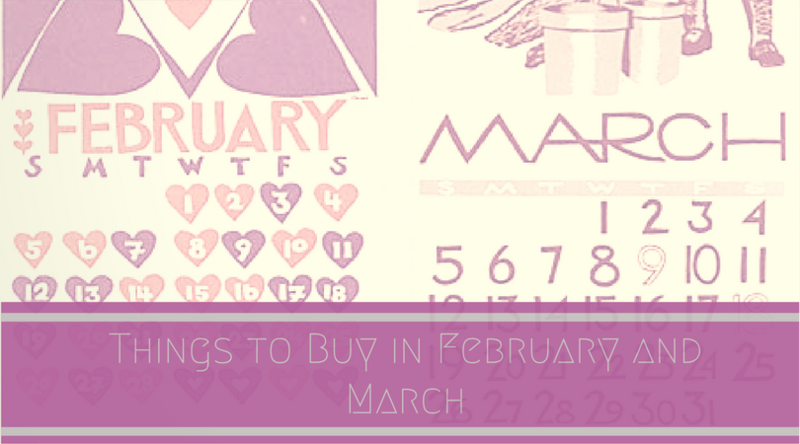 Today I’ll break down the best savings for February and March. February is National Canned Goods month, so you have a great opportunity to stock up on basics for your pantry. March is National Frozen Food month, take the time now to clean out your freezer in anticipation of some great deals. After Valentine’s Day, there will be clearance sales on candy including high-end chocolates, and you should see a few sales on sparkling wine and high-end meat and seafood around then also. It’s always smart to buy seasonal produce, so watch for brussel sprouts, kale, turnips, and citrus fruits in February, and artichokes, parsnips, pineapples, and mushrooms in March. A great time to buy a new TV is right before the Super Bowl, retailers will be taking the opportunity to sell off their excess stock. February is also a great time to buy cameras, video games, audio equipment, and air conditioners, or have your a/c serviced. March bargains include non-Apple smartphones and tax-filing software. February is a great time to stock up on winter clothes. For those of you living in colder climates, you can still use them for a bit longer. Winter sports gear will be on sale for President’s Day, jackets, skis, and snowboards will be at end-of-season prices. If you are looking ahead to warmer weather, February is a great time to pick out that new boat you’ve been thinking about. March sales will include running shoes and workout apparel. Winter sports gear will be at rock-bottom prices, and many small retailers will be willing to bargain. February is the off season in many places, it’s a great time to book a vacation and get more bang for your buck. Luggage will be on sale both months, new styles will be on the way into stores; older pieces will be discounted heavily. Mid-February sales will include bedding and towels, so start planning to refresh your linens for a new look. March home sales will include china and flatware in anticipation of wedding season. If nobody you know is getting married, fill in your own set. February is a traditional time for lawnmowers to go on sale, and in March garden tools will start arriving in stores. This means the leftovers will be marked down, you won’t find much available, but the prices will be great. After Valentine’s Day and through March there will be sales on jewelry and fragrances. Perfumes and colognes rarely go on sale, so stock up on your favorites now to use all year long. Every month is a great time to pare down on expenses, let Billcutterz do the hard work of getting better rates for you on your monthly bills. Simply sign up and submit your bills on our website and we’ll get right to work saving you money!